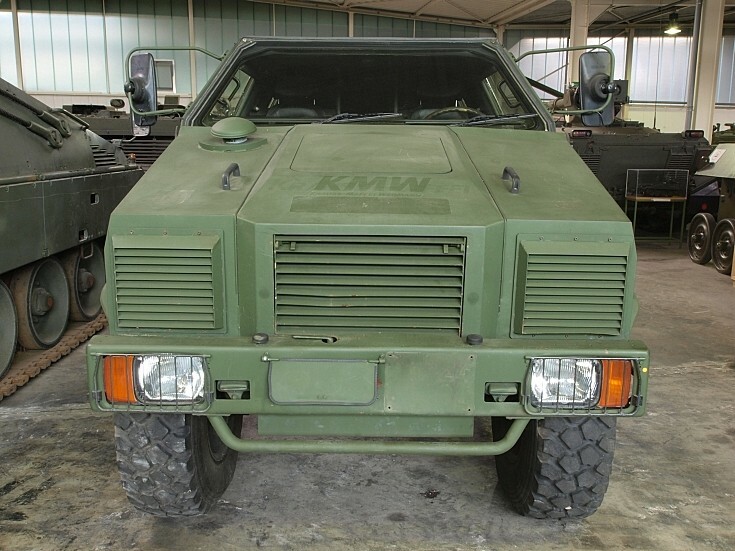 Front view of the Dingo ATF Allschutz-Transport-Fahrzeug / Allzweck-Traeger-Fahrzeug.Build to tranport 5 soldiers, it has a 7.62mm machine gun which can be used from within, a HVAC (Heating Ventilation and Cooling) system, a tyre-pressure adjustment system, ABS, GPS, Radio send and receive system and a megaphone system. So for 1996 it was reasonably advanced. In total 147 vehicles were build from 2000 untill 2002.